Chocolate Easter Eggs: The Sweetest Selection! Gardner’s Chocolate Eggs: To simply breathe in the intoxicating aroma of Gardner’s eggs is to know you have some seriously top quality chocolate on your hands! We have offered Gardner’s eggs every Easter for many years, and the demand for these rich and creamy confections never wavers. Choose from Chocolate Fudge Nut, Butter Cream, Coconut, All Nut, Cashew Meltaway, Fruit and Nut, Maple Cream and Nuts, and my favorite, Peanut Butter Meltaway. Zitner’s Chocolate Eggs: Another name that many turn to Easter after Easter is Zitner’s. A candy company whose beginnings were more than 90 years ago, many of us in the Northeast have been enjoying Zitner’s as far back as we can remember! Best known for their insanely delicious Butter Krak eggs, we also have their dark chocolate covered Marshmallow eggs available. But you should act fast – Zitner’s are an affordable treat and sell out quickly! Cadbury Eggs: You didn’t think we’d forget these classics, did you? How could we?! Every Easter we put in an order that rivals the one the Easter Bunny himself must place, and every year we sell every last egg. Our selection includes classic Cadbury Crème Eggs, Cadbury Mini Crème Eggs, and the speckled spectacular sweets known as Cadbury Mini Eggs! St. Patrick’s Day Candy Recipe Creations! Rainbow Cupcakes: When we first saw this colorful cupcake we couldn’t put our fingers on what the rainbow was made of. We’ve been in the candy business for many, many years, and we’re pretty good at picking out sweets even if they’ve been modified in some way. Well, imagine our pleasure and surprise when we read the ingredients and realized it’s an Airheads rainbow! 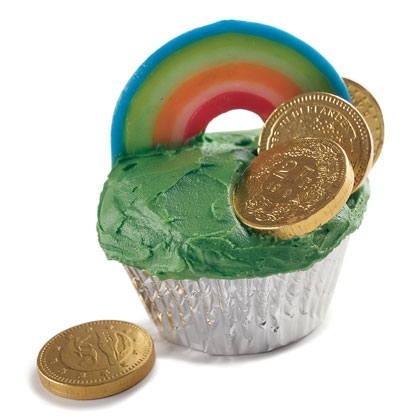 You’ll need Airheads in a few different rainbow colors, and gold chocolate coins for the end of the rainbow as well. While making Airheads rainbows seems as though it could be a bit tricky, the ease of the rest of the recipe definitely makes up for it. 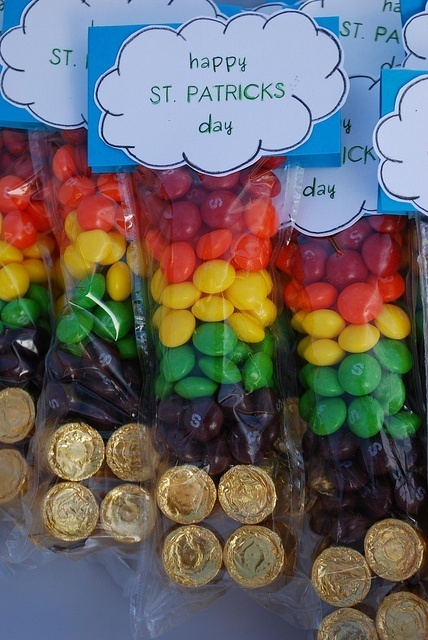 Skittles and Rolos Treat Bags: Aren’t really up for baking, but still want St. Patrick’s Day treats that make a splash? These couldn’t be cuter or easier! Simply purchase cellophane candy bags and fill the bottom with gold. Or, you know, gold foil-wrapped Rolos! Gold chocolate coins could work as well, or just about any candy in a golden wrapper. Next, layer on the Skittles by color, keeping Roy G. Biv in mind! Secure it at the top and try not to jostle them around too much. You want to be sure your Skittles don’t have an opportunity to get mixed up in the bag. Want even more, you say? Check out these Pins!